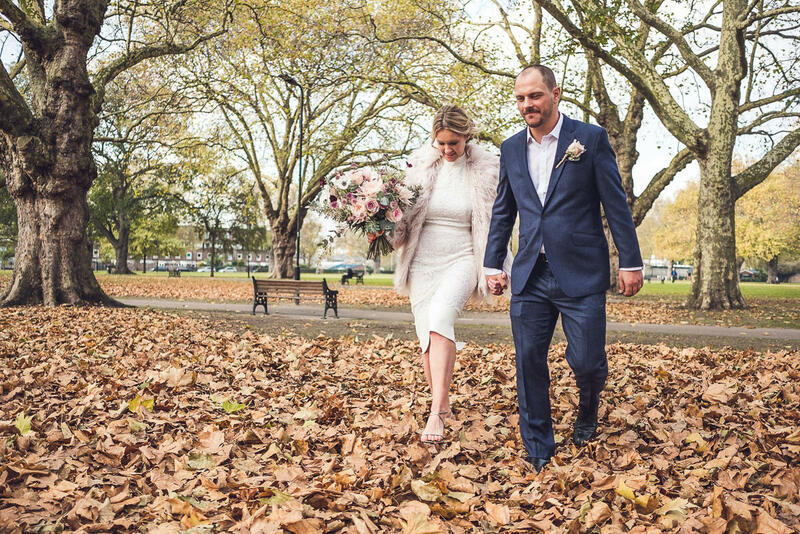 Does it get any better than Autumn days, beautiful light and the most intimate of all weddings? 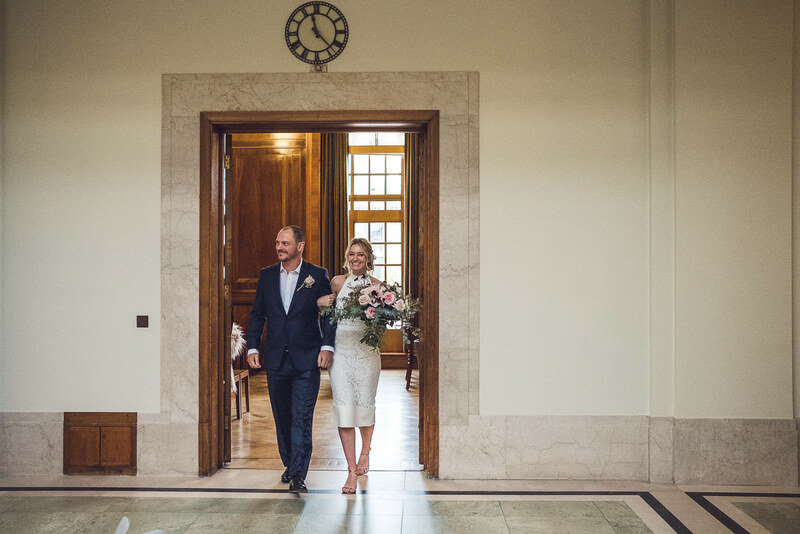 I spent a few short but sweet hours with Jacqueline and Henry for their Hackney Town Hall Elopement photography, before they jumped on the Eurostar to Paris to celebrate their marriage. 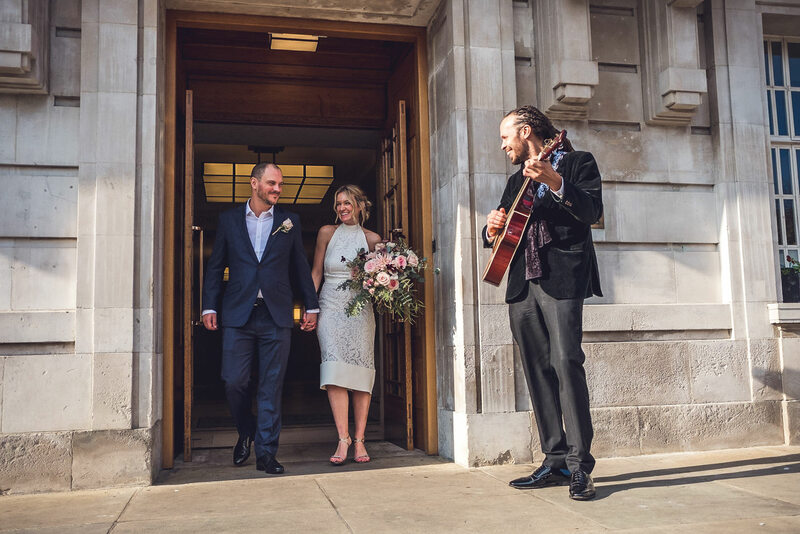 It was just the two of them, plus their two witnesses as friends and Daniel their wonderful guitarist who accompanied us for their post elopement portraits. 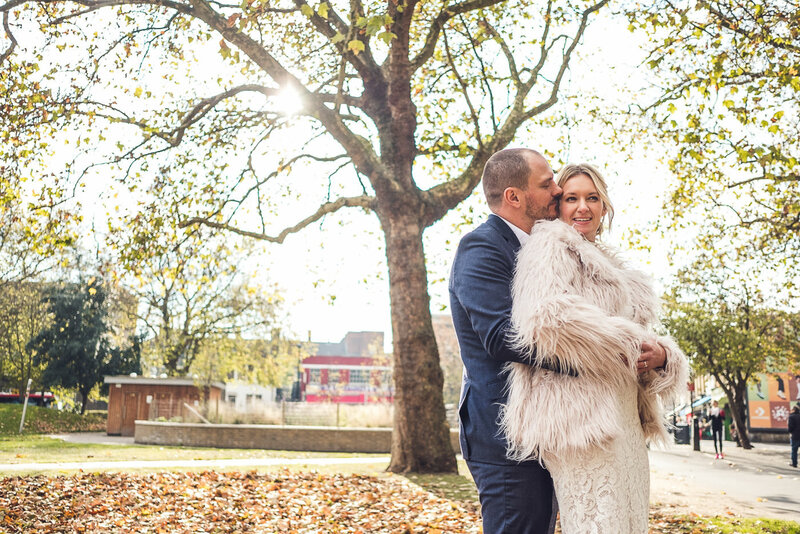 It was all kinds of wonderful having beautiful music while we took pictures in the Autumn leaves in London Fields. 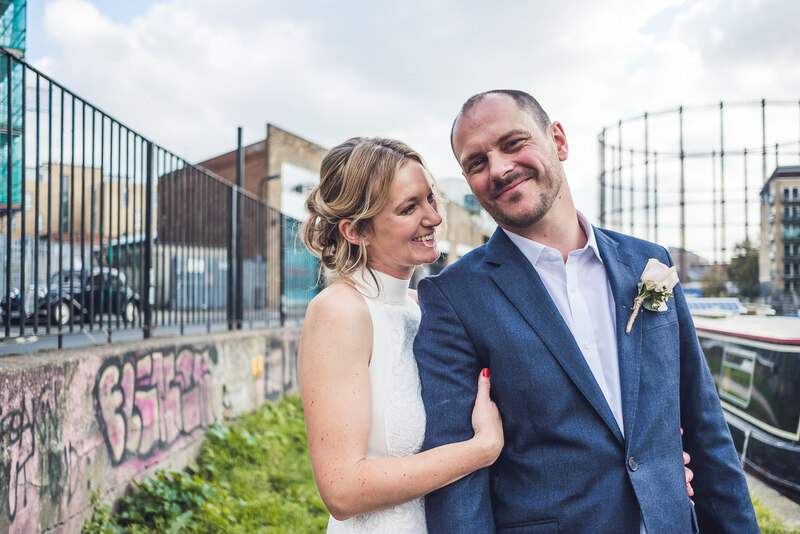 Here’s what Jacqueline and Henry had to say about working with me: We chose Babb Photo because we loved Laura’s natural, impulsive style and the fact her weddings look ‘real’ and not like they were airbrushed or shot through a vaseline lens. 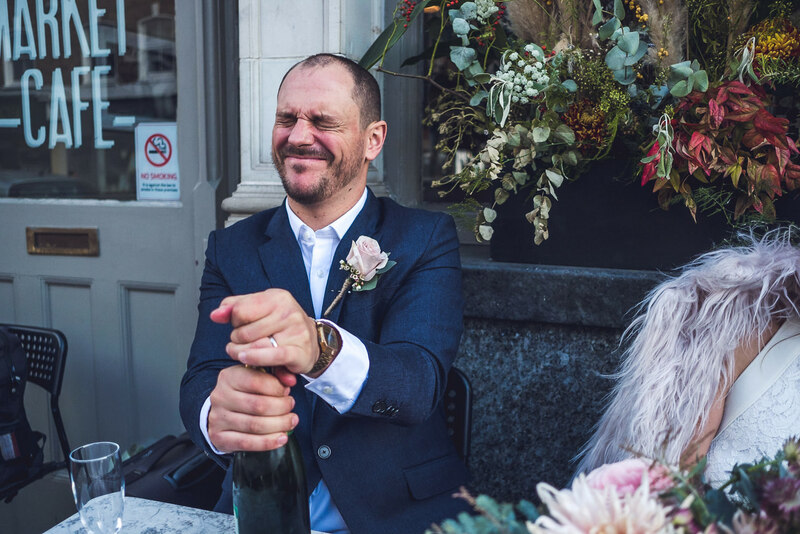 We like seeing simple, natural and authentic portraits, complete with all the laughter and tears and everything. 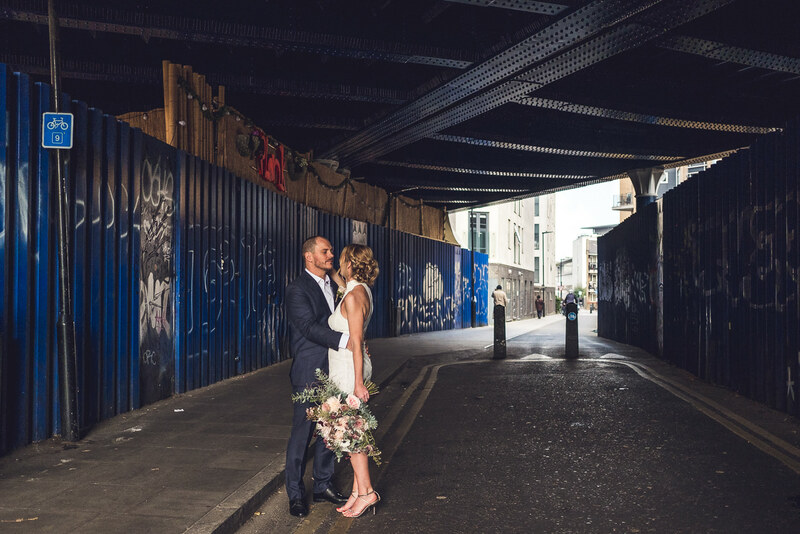 The very polished, posed look didn’t appeal to us at all, as we wanted to look back on our photos and really feel the emotion of the day over and over. 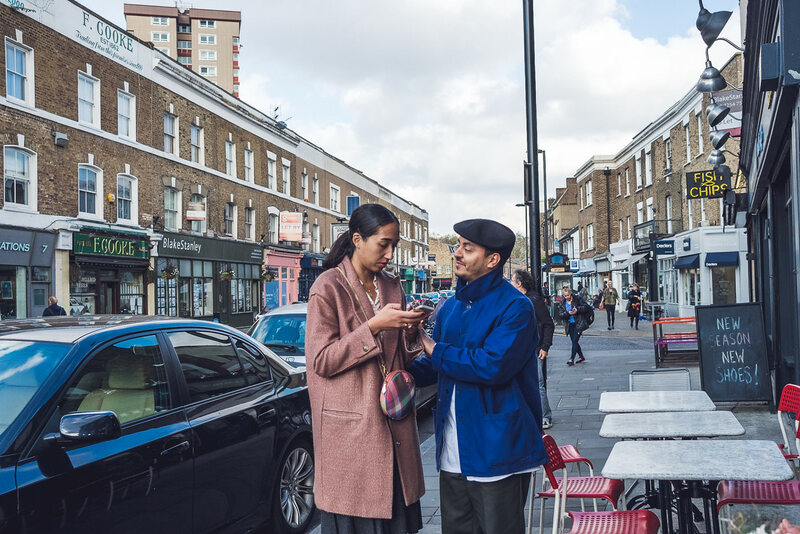 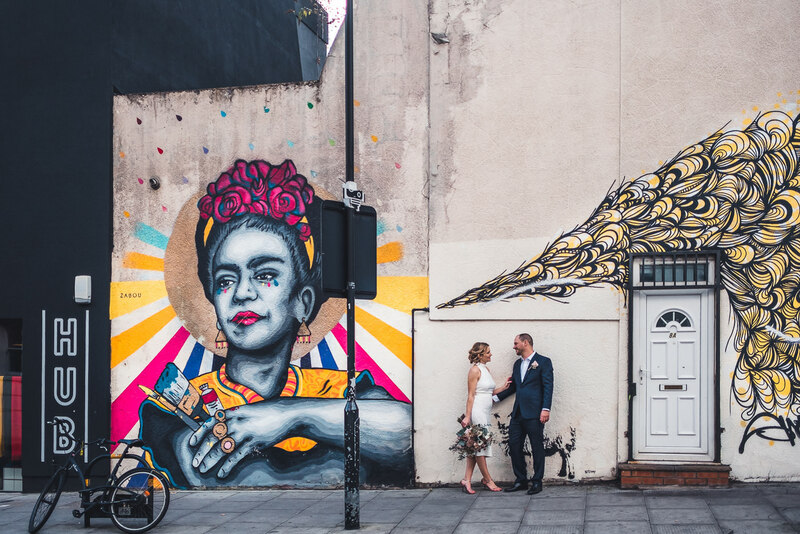 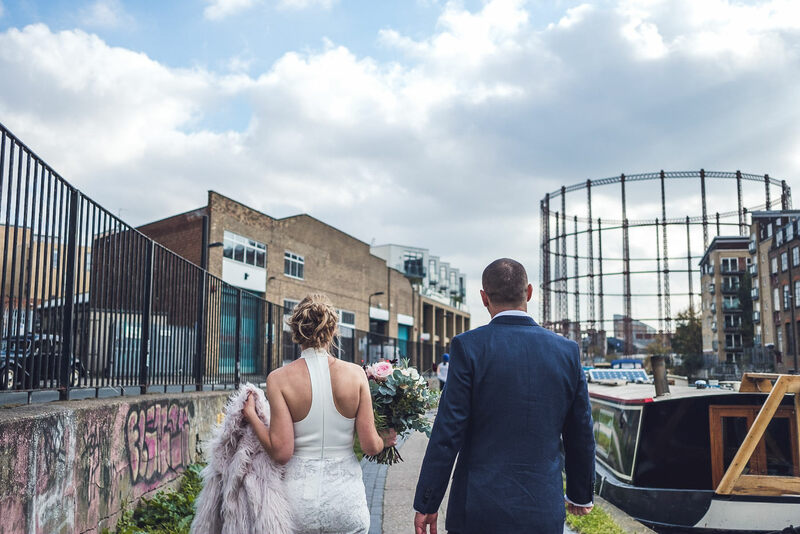 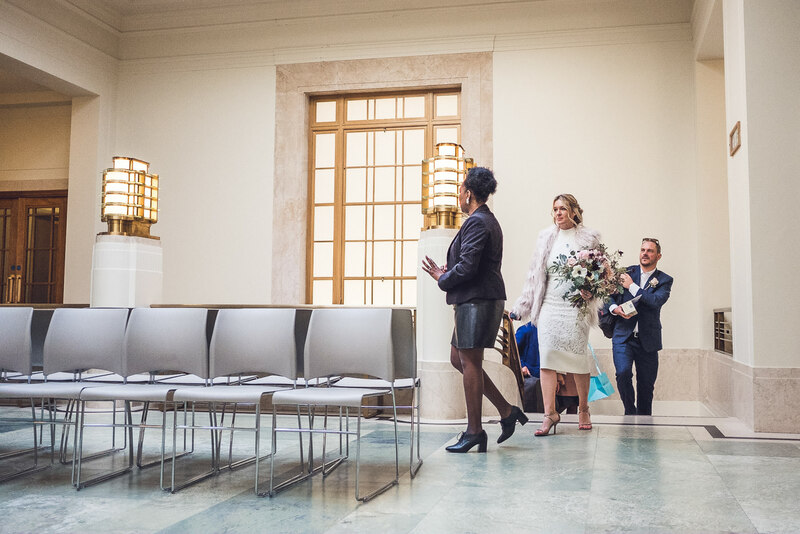 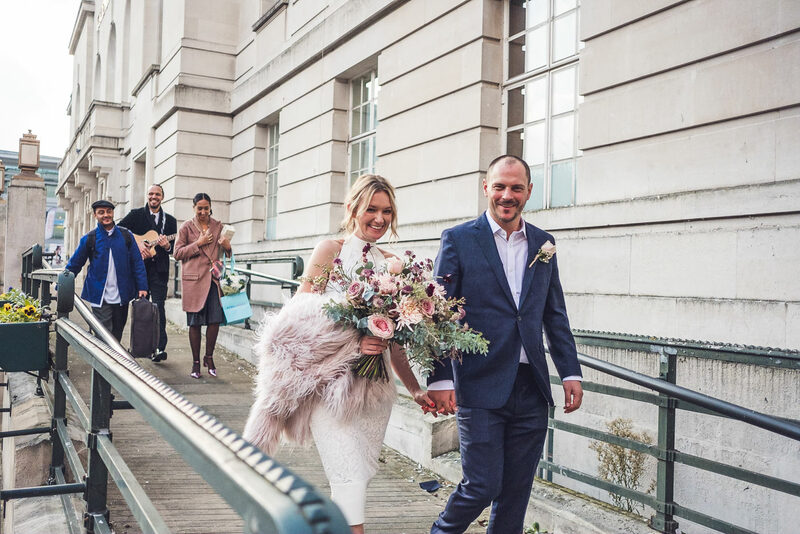 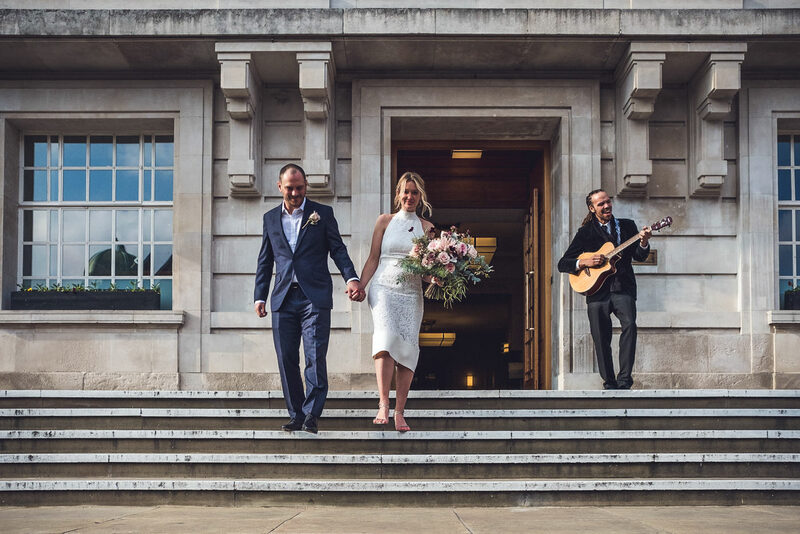 Scroll down to the bottom to read all about their Hackney Town Hall Elopement photography and wedding day in their own words. 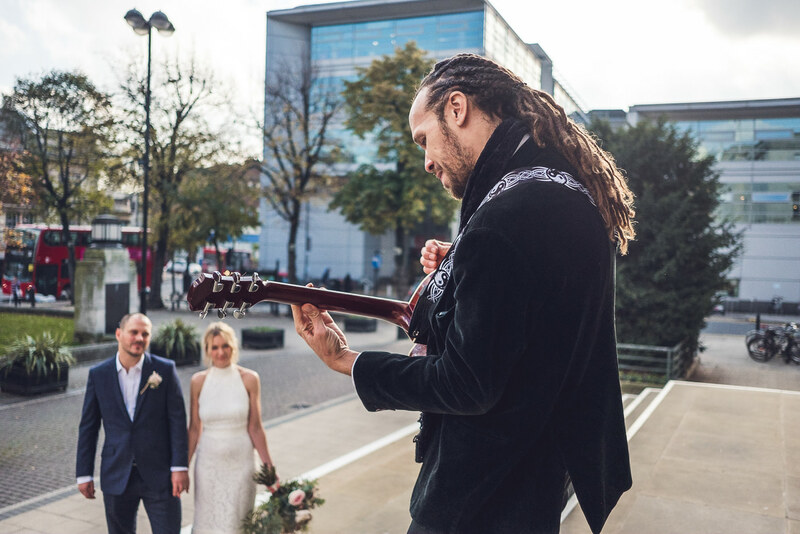 We met in sunny Melbourne, Australia, through a mutual love of music as we both played in bands which from time-to-time shared a bill together. 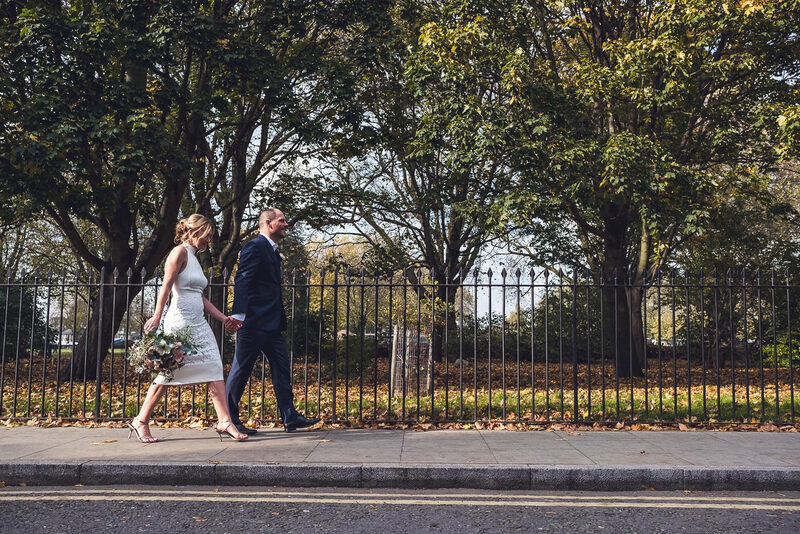 Jacqueline had already booked a one way ticket to find her fortune in London, and after awhile Henry decided he was coming too. 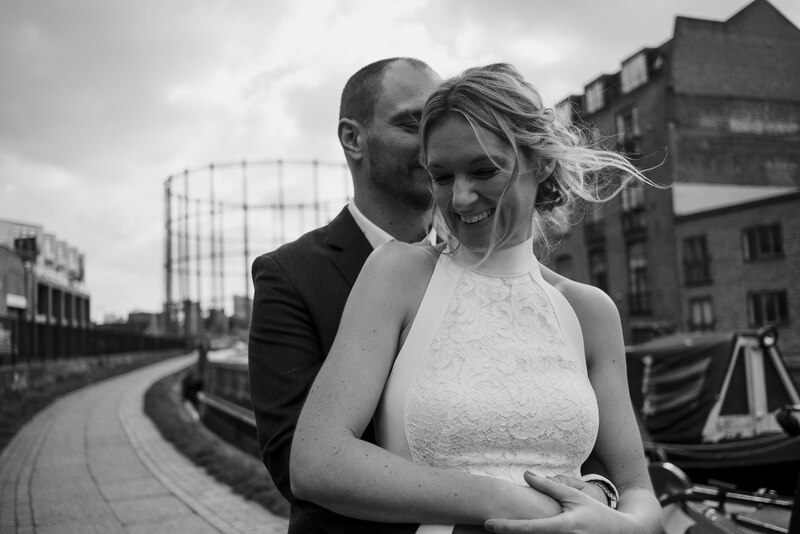 We moved to London together 7 years ago and haven’t looked back since. 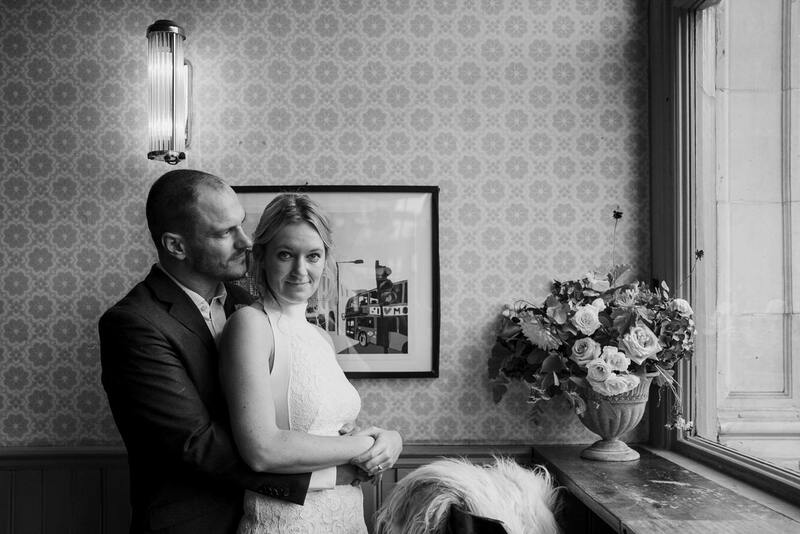 Jacqueline travelled to New York for work in July of 2016, and Henry joined her for a few days. 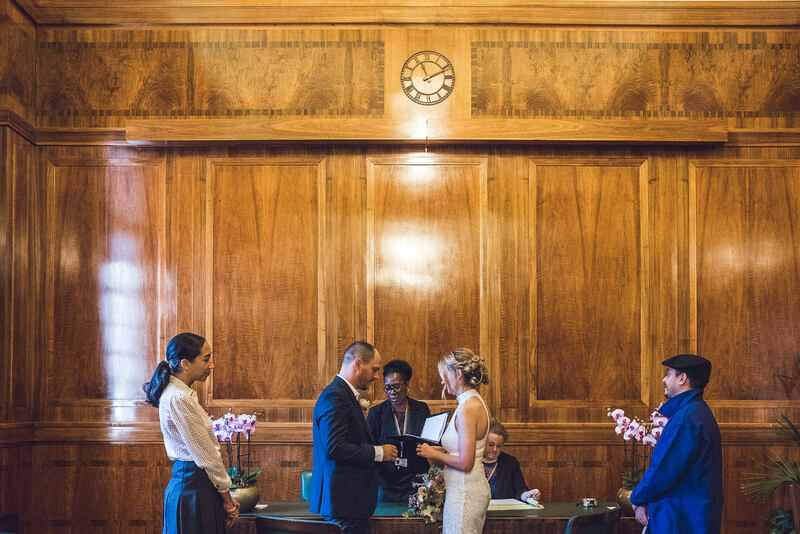 They got engaged during an early morning run along the Hudson River in NYC, with the sun shining over the Statute of Liberty, and got married 18 months later. 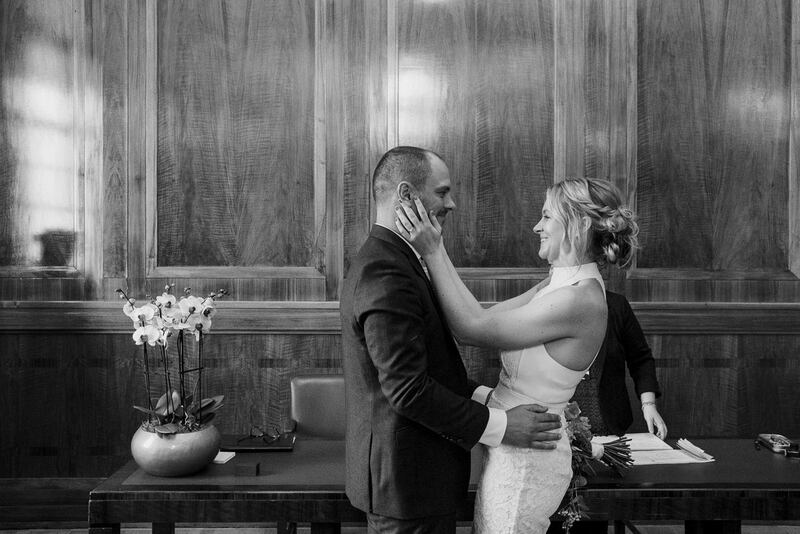 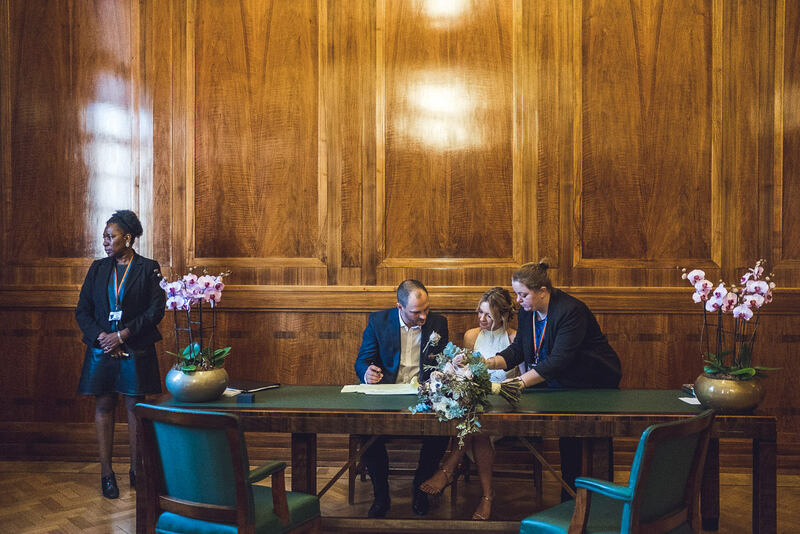 We eloped, so the only venue we chose was Hackney Town Hall. 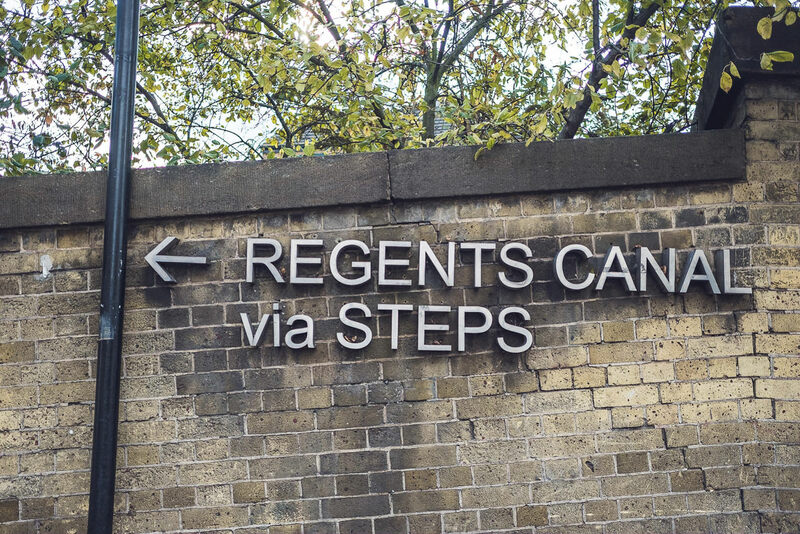 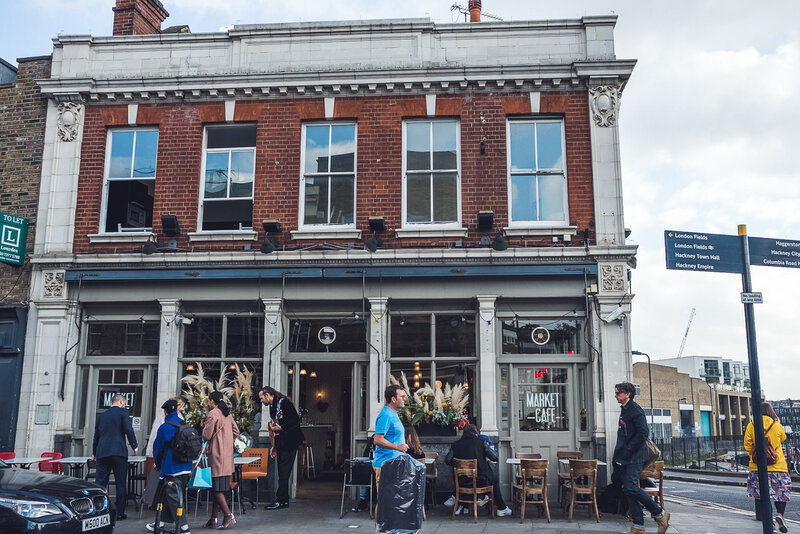 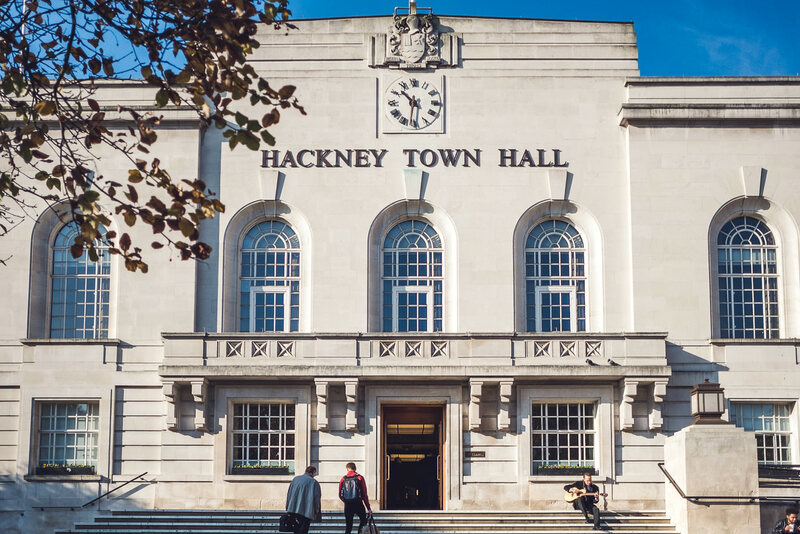 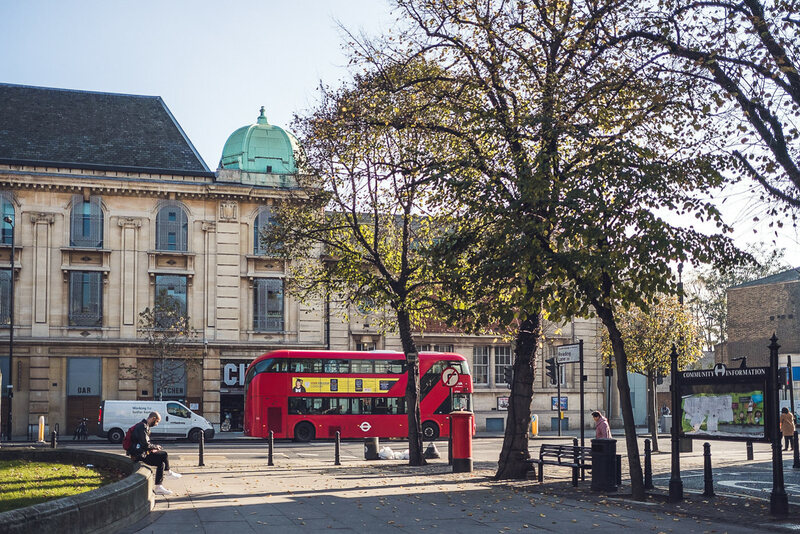 Hackney Town Hall holds a special place in our hearts, as our first flat in London was in Mare Street, Hackney, and our first year in London was during the heady summer of the London 2012 Olympics, which largely took place in the Borough of Hackney. 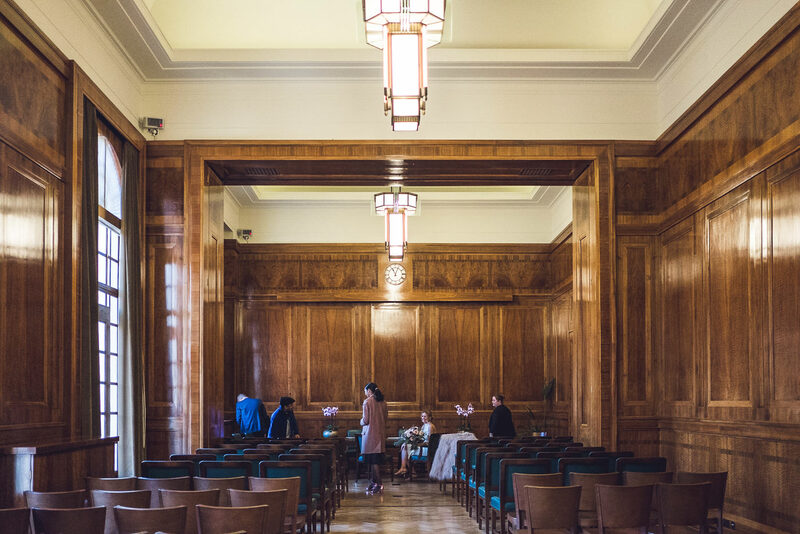 It also has the advantage of being a beautiful, art deco room, with some of the friendliest staff in London. 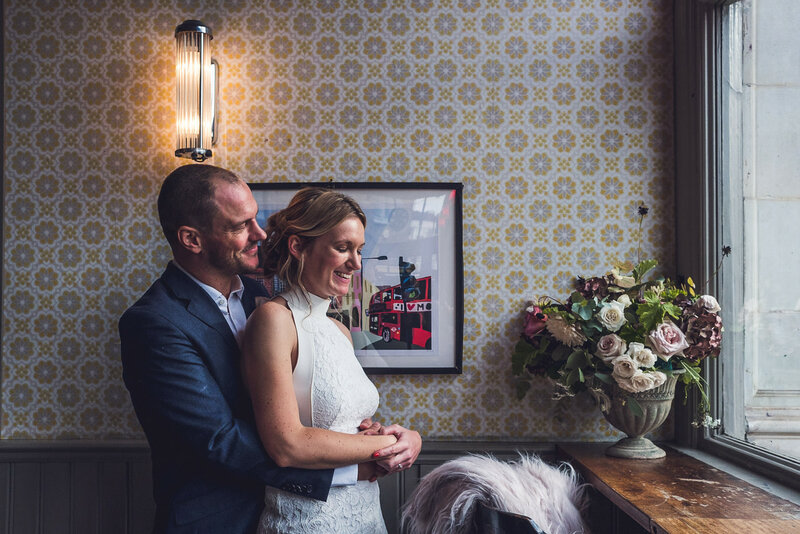 Henry wore a suit sourced and tailored by those good folk from TM Lewin. 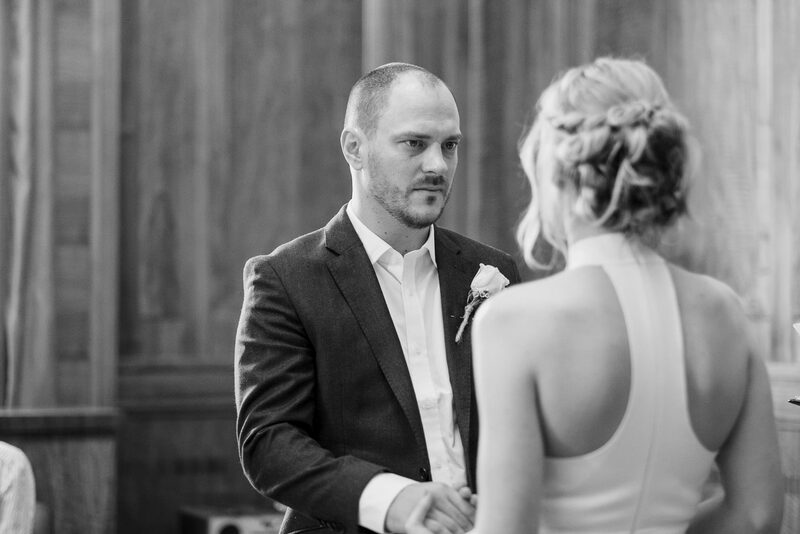 He chose Navy as he didn’t want a traditional, sombre, black double-breasted number. 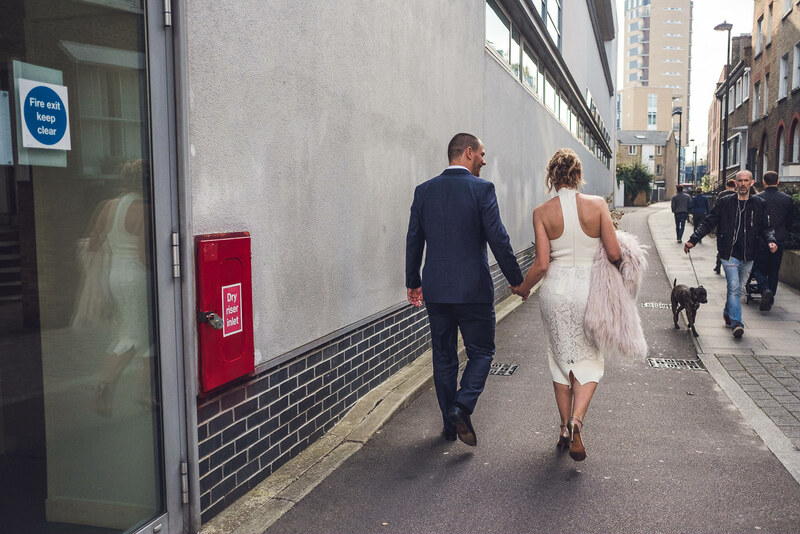 Jacqueline worn a halter-neck lace midi dress from cult Australian label Lover – a nod to home and quite non-traditional, which appealed. 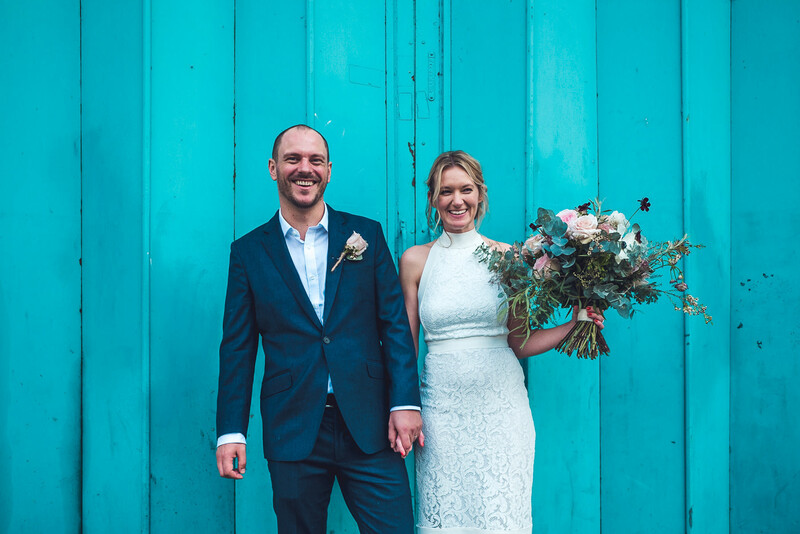 She’s not a fan of jewellery or other frippery so wore the dress on its own – no accessories needed! 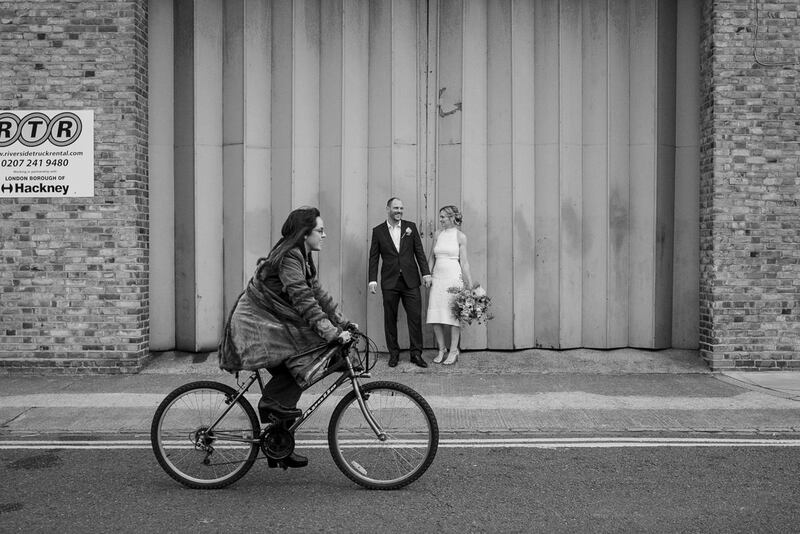 As we eloped there wasn’t much to do in relation to styling. 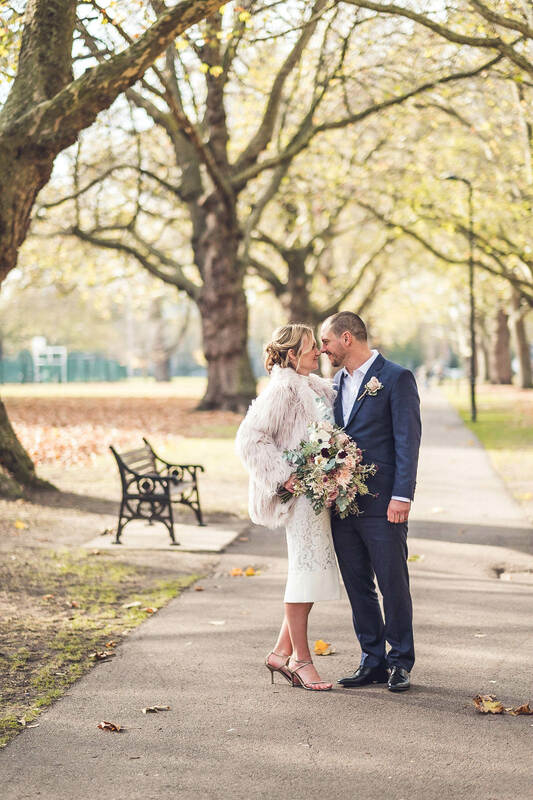 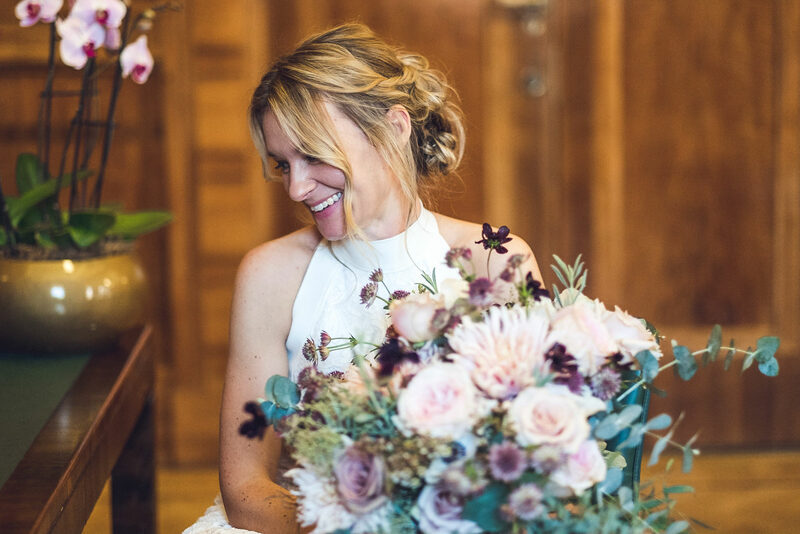 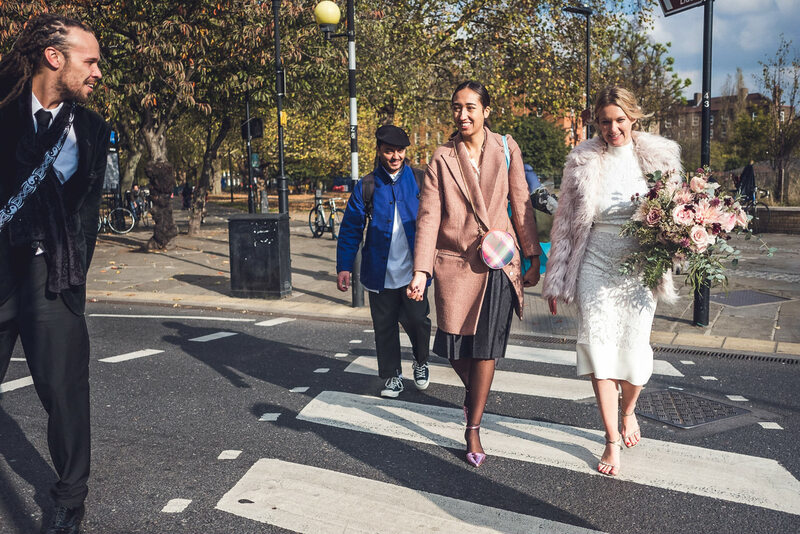 Jacqueline had a beautiful bouquet of both English and Australian blooms in whites, greys, nudes and pale pinks from amazing Hackney florists Rebel Rebel,. 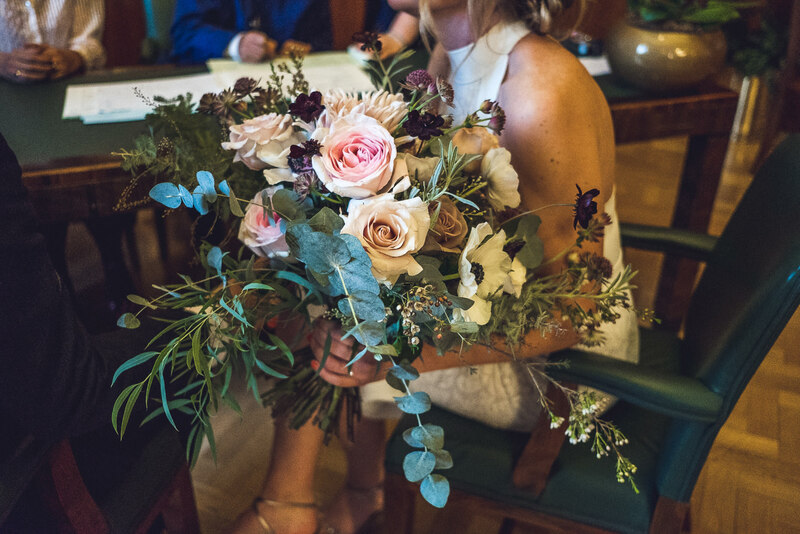 The ‘feature’ blooms were beautiful Prince Jardiner Roses, Cafe Au Lait Dahlias, along with Amensia and Quicksand Roses, coupled with Dollar Eucalyptus, and Moonlight Wattle. 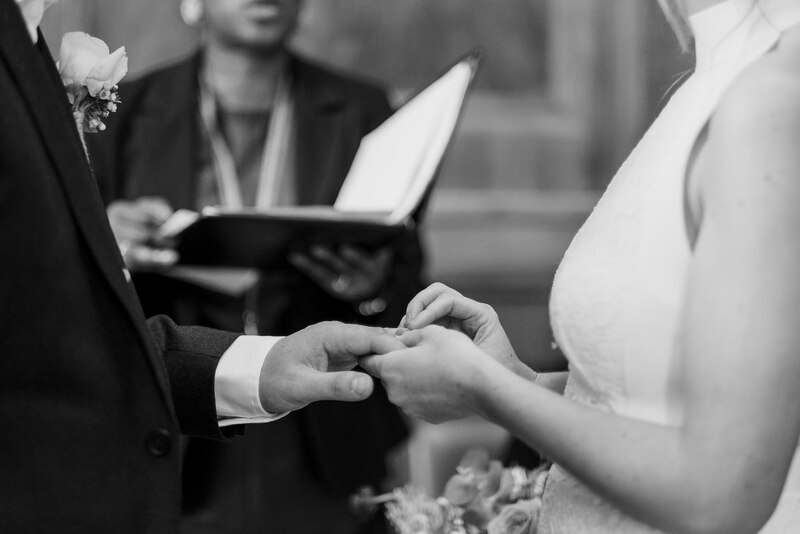 Henry had a matching button hole arrangement. 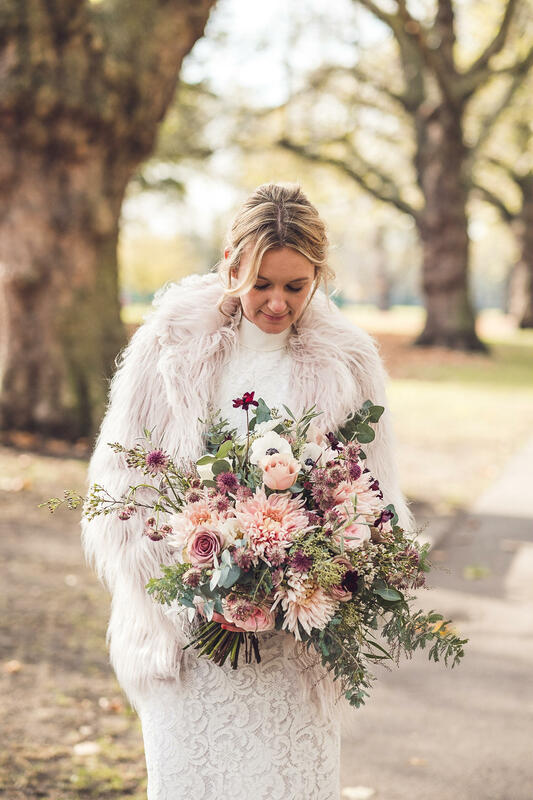 Colours will be whites, greys, nudes and pale pink. 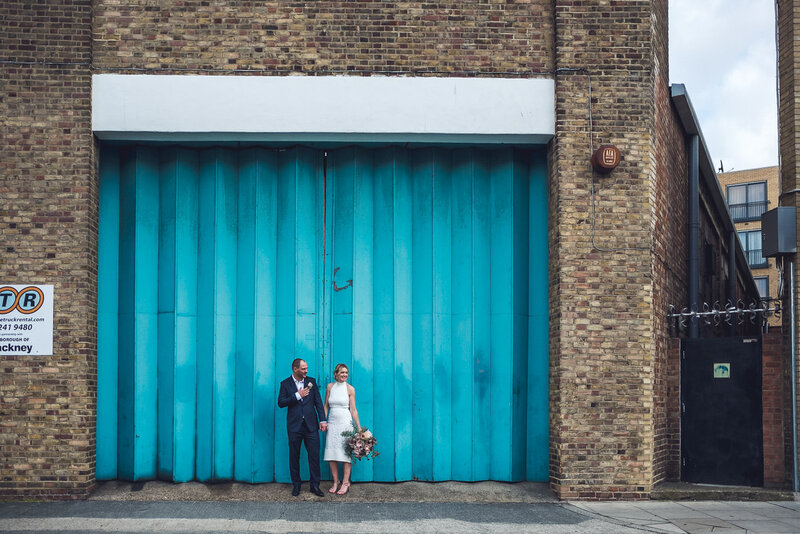 It will have an English look but contain eucalyptus and wattle foliage as a nod to Australia. 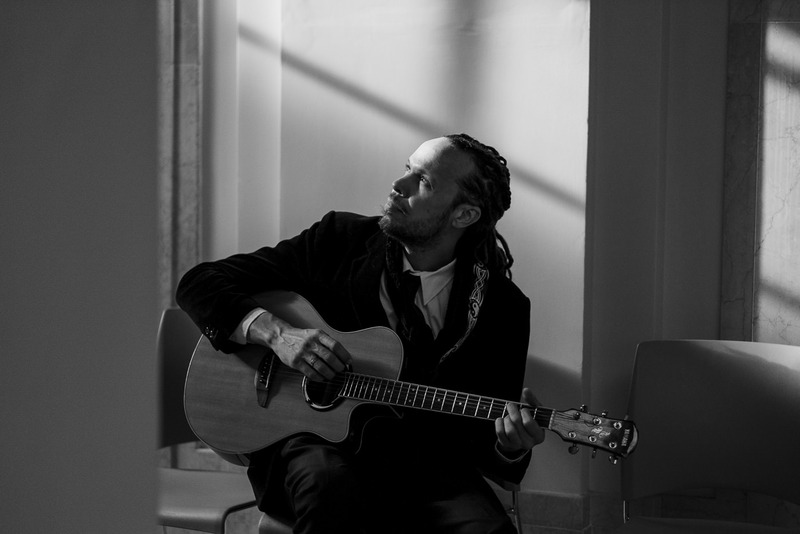 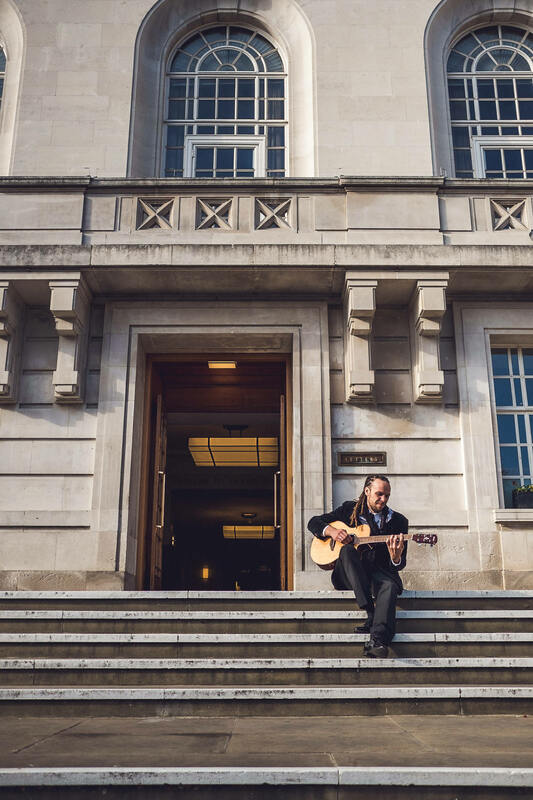 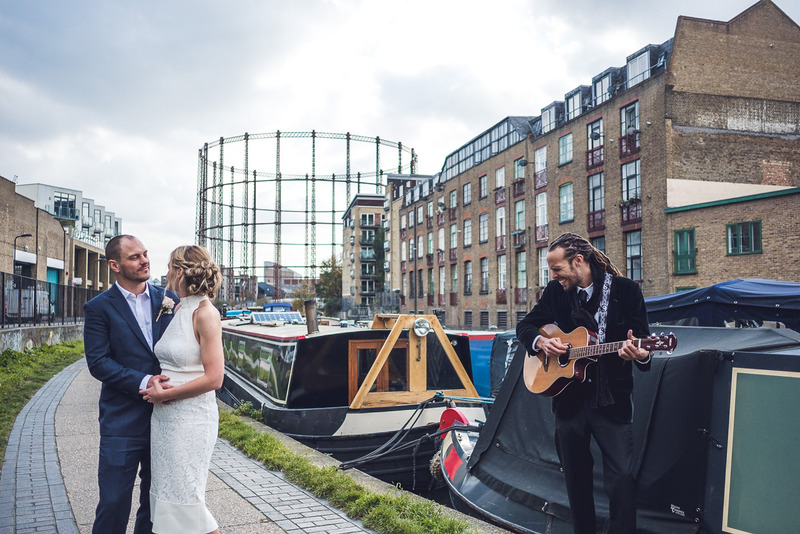 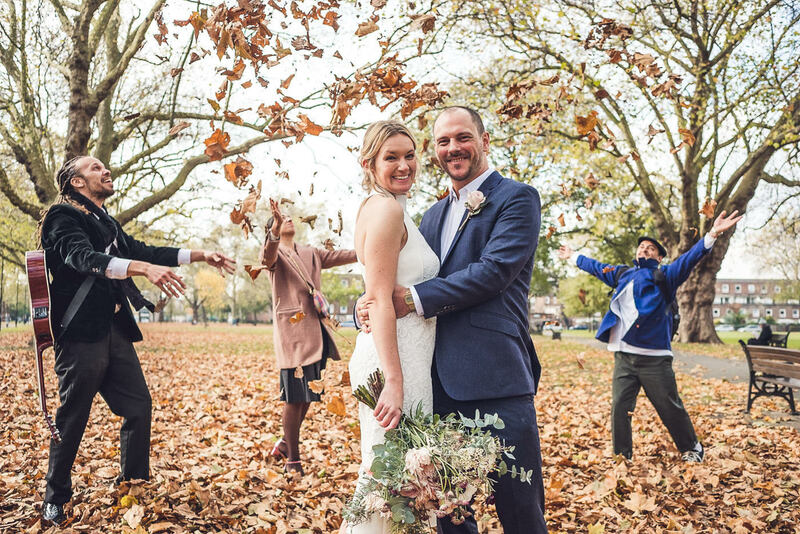 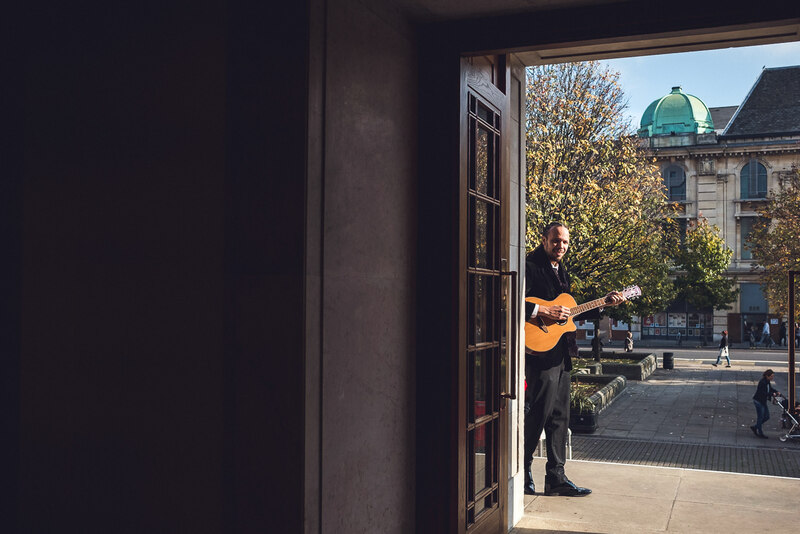 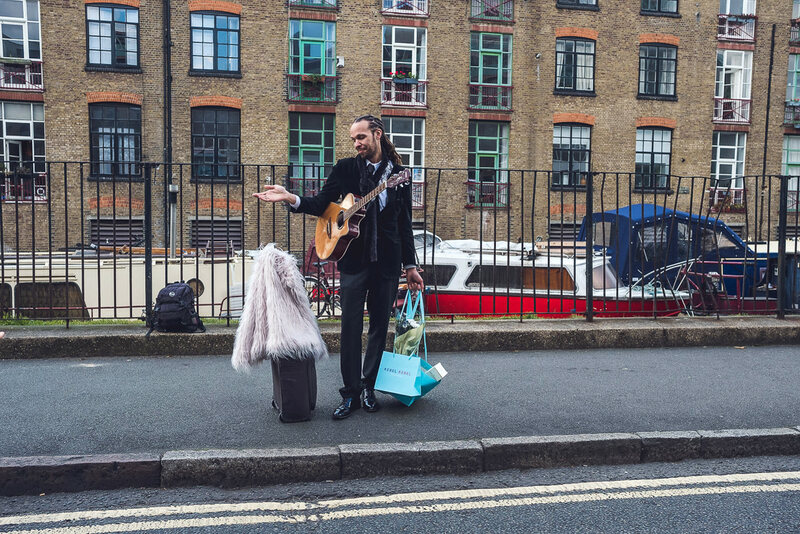 We eloped, so didn’t have an evening event, but we book Daniel, an amazing guitarist and soul singer who serenaded us on the Hackney Town Hall steps with some soul classics, then followed us through London Fields and by Regents Canal with some of our favourite tunes. 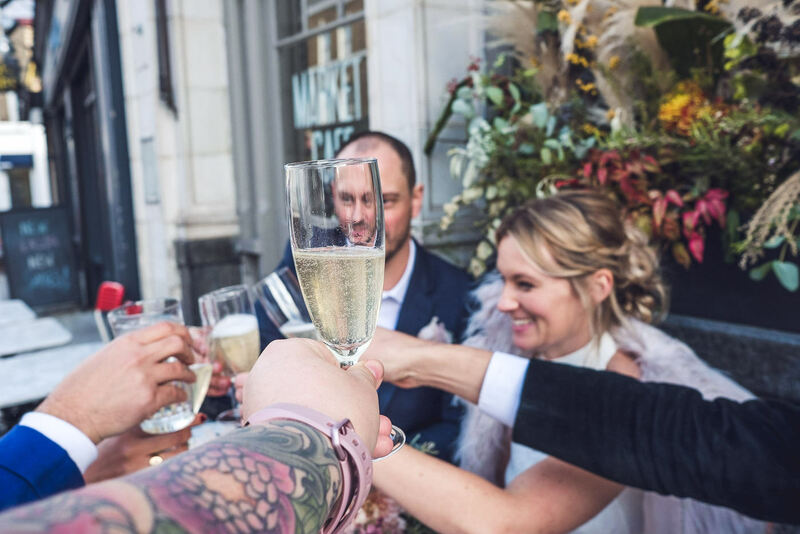 Do what feels right for you – don’t feel like you have to have a big day full of pomp and ceremony to make other people happy. 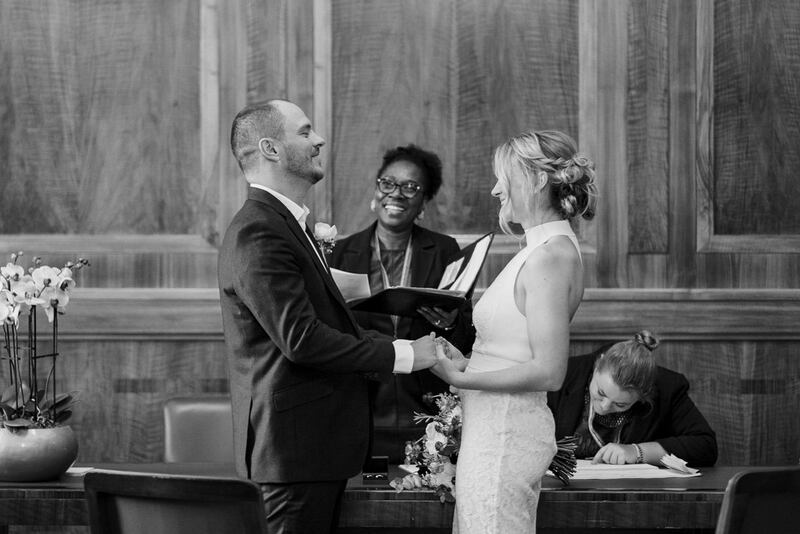 Our day was simple, sweet and inexpensive, and it was perfect for us. 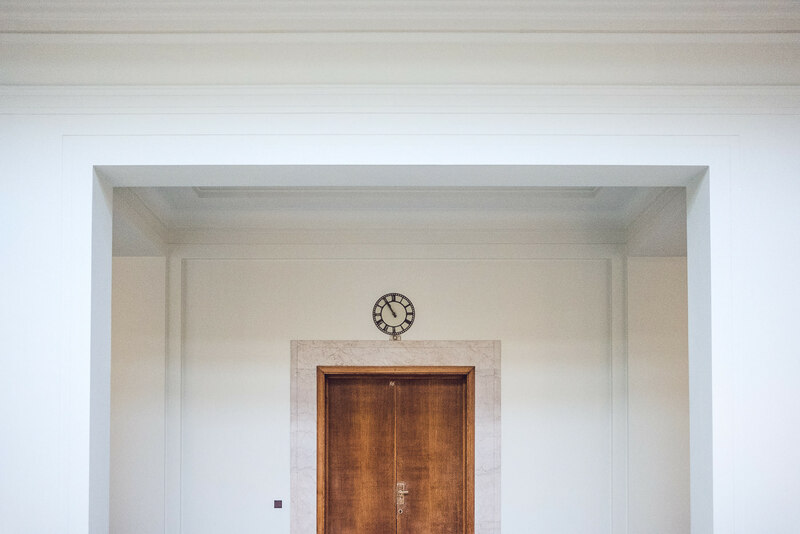 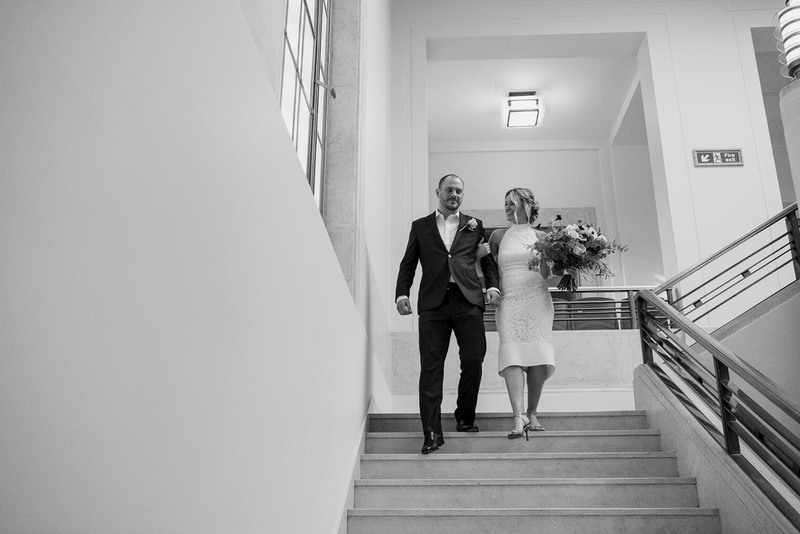 Hackney Town Hall Elopement photography by Babb Photo. 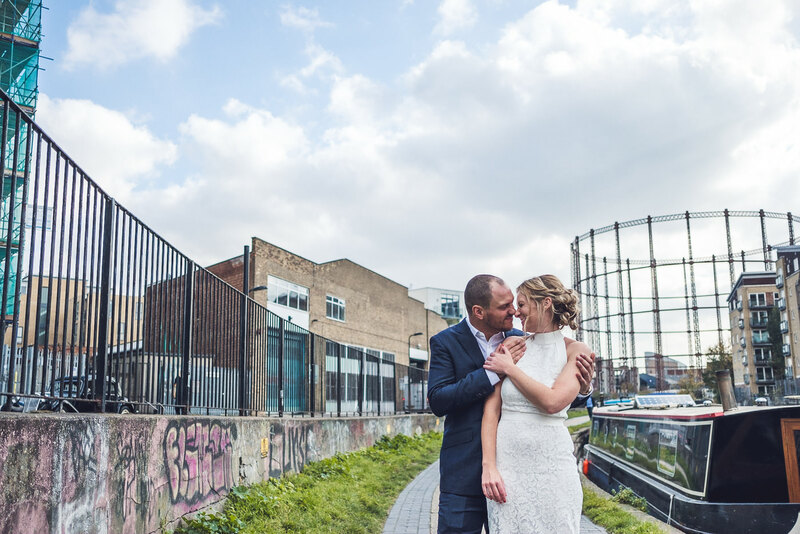 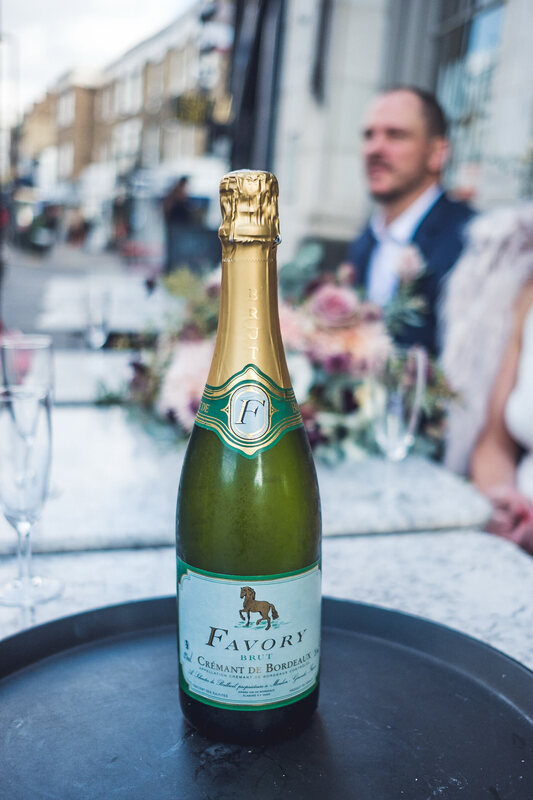 Check out some more London wedding photography and head here if you’re looking for London elopement ideas. 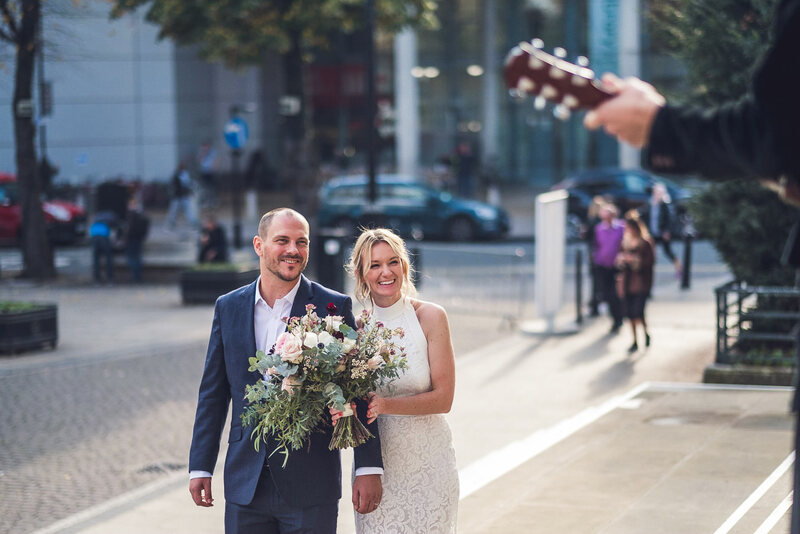 If you’d like to have a chat about your wedding or elopement you can contact me here!